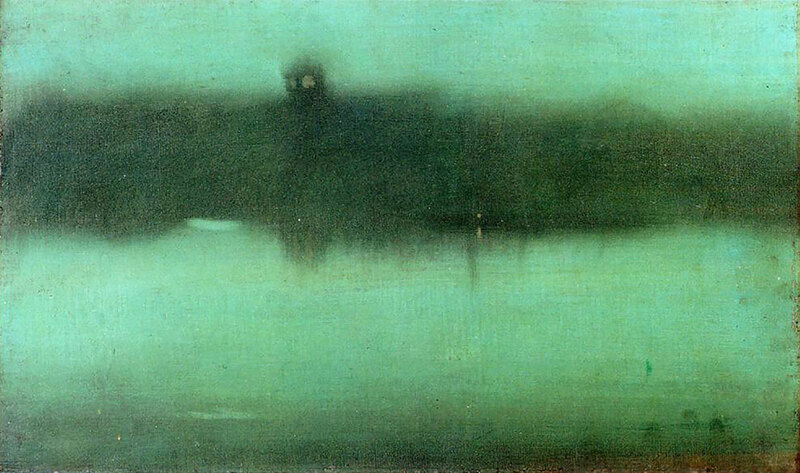 Esoterica: James McNeill Whistler (1834-1903) was a painter who saw a relationship between painting and music. He exploited unifying and simplifying harmonies to achieve moods. He magnified simplicity and softened complexity. Delicate and wispy passages were often placed within grander themes. “A picture is an arrangement of light, form and colour,” he said. His titles often included the words symphony, nocturne and harmony. 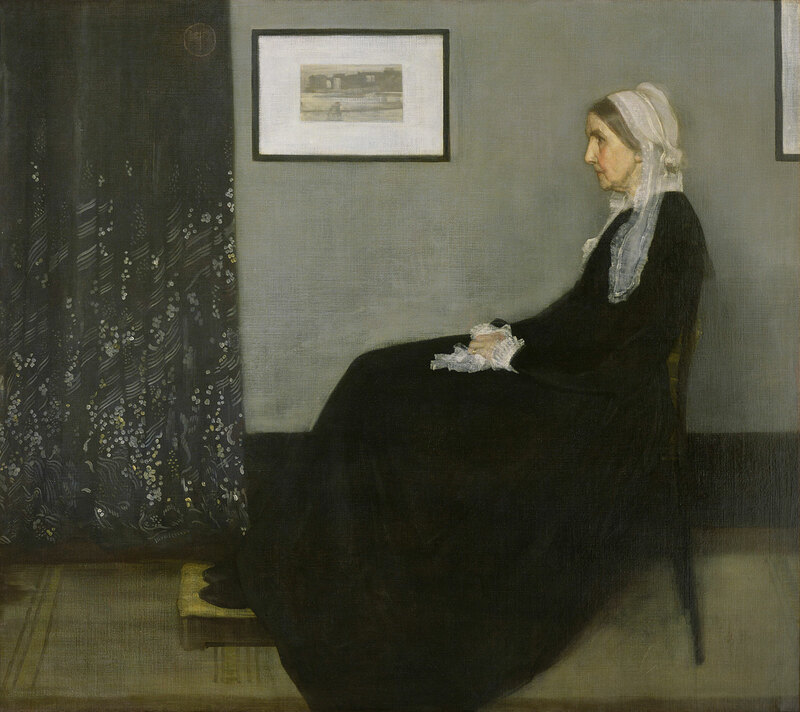 The title of the painting known as Whistler’s Mother is Arrangement in Gray and Black. This letter was originally published as “Let there be music” on December 17, 2004. This advice is so timely to me – thank you so much! :) For my desert island music, I would bring Vivaldi’s The Four Seasons – played by Nigel Kennedy. While this is my favourite piece of classical/baroque music and I love it no matter who plays it, Kennedy gives it a spark like no other. I will give it and Sibelius a listen next time I’m in the studio! I have a recording of it played by a Koto orchestra, just incredibly stirring to hear. I would like to share some of your words in our small watercolor newsletter. How do I get permission? I know these words of artistic advice will receive credit for content. Thank you. You are welcome to share this letter and others on your newsletter, thanks for asking. Thanks for crediting Robert Genn as the author and including the direct URL to this letter http://painterskeys.com/let-there-be-music/ or http://www.painterskeys.com. My mother was musically inclined so we all learned to play instruments. I started on piano- but switched to cello- then bought a bass guitar in my teens. One of the very few regrets I have is not becoming adept on the guitar because of the subtle differences between it and the cello. However- I still own it. But always a visual artist- that need to create visually (and a job) usurped music for a number of years. Right up until I decided to start spinning dance music in clubland. My second career was born- simultaneously to putting myself on my full-time art path. I managed to work parallel art/music jobs for the next 7/8 years- until finding myself too depressed to make other people happy dance- thereby becoming politically incorrect. Oh well. But I never stopped programming music- and my studio is constantly awash in trance music- of all kinds. And my art/music creation experience is 100% integrated. And I live alone so nobody gets to tell me they don’t like what I’m listening to or they’d prefer to watch tv. Wishing every creative spirit that reads and shares in the Painter’s Keys inspiration renewed creative energy, inspiration and especially happiness in all of your endeavours in 2017. I love painting to music in front of an audience. I have done seveal “performance” pieces to QUEEN, ABBA, and LEONARD COHEN. They are large (60×72) acrylics and very well received. No preconceived images I just have large containers of paint ready with big brushes. Oh what fun! I couldn’t agree more with Robert’s thoughts on this matter! For the most part, I also have music playing while I paint or draw. The aformentioned Vivaldi ‘Four Seasons’ is a real favorite, as are works by Strauss, Beethoven and contemporary classic performers ie. The Canadian Tenors, Jim Brickman, Michael Buble…. Sometimes I’ll start a painting session with something upbeat, like Jimmy Buffet or some old Motown tunes, to switch to more low-tempo classic works/instrumentals. Funny how my strokes will pick up the beat of some music and my mind becomes more focused with others. Artists of many genre certainly move to the rhythm of their own drums, creating inspirational works of so many media. I have to admit to being hearing impaired and having the volume so high on my stereo, even my ‘studio’ cat leaves the room! Sometimes we just have to ‘feel it’! What a great letter. I very much need this encouragement to not dwell on the details in front of me. It’s a constant struggle to “loosen up” and not be ruled by the actual scene. sometimes music is a distraction but if I had to chose it would be jazz by Ella or Fats or Natalie Cole. They transport me out of any dead space. I just saw the “Landscapes” show at the AGO in Toronto. 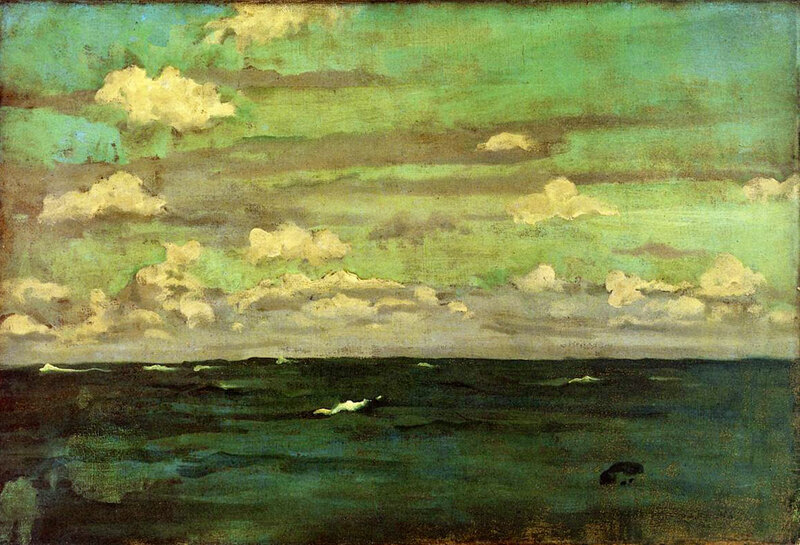 Though overall somewhat in-cohesive, there were a few memorable pieces, not one of these of Whistler’s though. I like these much better and they represent landscapes so much better. There was a fabulous Norwegian painter who did night capes of the fiords and city, very dark blues with just the city lights along the coast to distinguish sky from water. The Violin concerto, Yes. And the magnificent, grand second symphony, which I think captures the huge emotions that the politics of Finlamd generated at the time. Love this post. I have painted and played the piano most of my life but took up writing in my later years and now the author of four novels (one just published) and a memoir. With the three outlets, I never suffer from block or boredom. One activity seems to feed off another and I can’t say which I love more. I just know that creativity keeps me alive and happy. Happy Holidays. What a delightful gift this season! 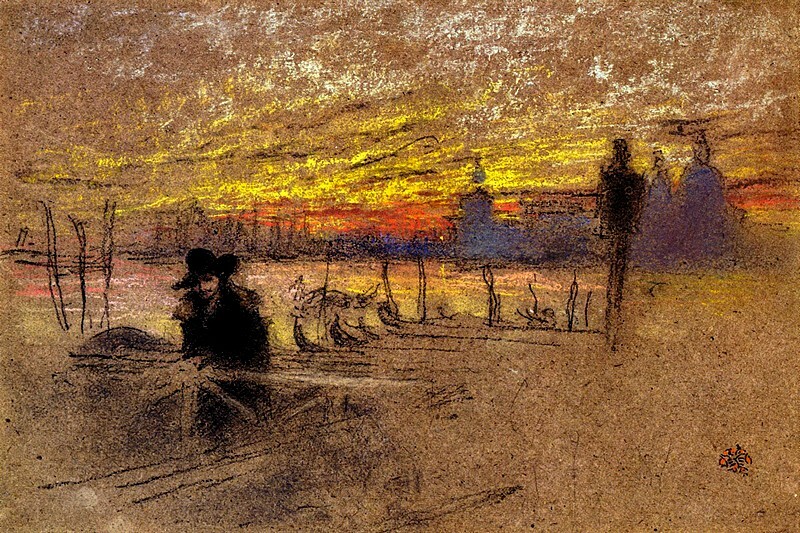 Robert’s insights into the heart of creativity strike true as do James Whistler’s paintings. I hope to be reminded again next year. Thank you, Sarah. Once I dreamed of painting as one of these artists describes, with very large brushes, and large a canvass. The paint was in house painting sized cans. The brushes could have painted a bridge! I was doing abstracts, which I never did. I have been a people painter. I seemed to be on a large stage and painting scenery. I have always wanted to do that. I woke up feeling so happy! I listen to music all day on Classic Arts Showcase or other music stations. I am alone now and so can turn it up as far as I want. Neighbors cannot hear. I think of music as the other voice of God.